After several days of volatile trading, oil is set to close on a quiet note as the world awaits the U.S.' decision regarding the Iran deal. Oil prices are set to close out the week on a quiet note after several days of choppy trading. The markets are still waiting for direction as the U.S.’ decision to scrap the Iran deal ahead of the May 12 deadline looms. IEA: Deepwater investment set to grow. The IEA said in a new report that while overall offshore oil production will likely remain flat through 2040, output will shift from shallow water to deepwater. Brazil will stand out as the most attractive place for deepwater development. In a separate scenario that incorporates more sustainability goals, offshore wind thrives while offshore oil production withers. Pemex to drill first discovery since energy reform. Pemex is gearing up to develop its first offshore discovery since Mexico’s energy reform more than four years ago. "That is going to be a very big milestone in the energy sector in Mexico," said Carlos Treviño, Pemex’s CEO. He said Pemex was evolving to run more like an international oil company rather than a state-run company. Libya’s NOC withholding crude from Total. Total SA (NYSE: TOT) purchased a stake in the Waha oil field from Marathon Oil (NYSE: MRO), a $450 million deal that was closed in March, but Libya’s National Oil Corp. is not handing over Total’s share of crude cargoes from the project, according to Reuters. Libyan officials have some objections about the deal and it appears that the NOC is intervening and withholding cargoes as the dispute lingers. Trump proposes easing drilling rules in U.S. West. The Trump administration is proposing gutting protections for an endangered bird, the greater sage grouse, to make it easier for oil and gas drilling on public lands in the American West. ExxonMobil moves forward with Rosneft LNG project. ExxonMobil (NYSE: XOM) is moving ahead with plans to develop a $15 billion Far East LNG project with Russia’s Rosneft, despite a costly exit from a prior joint venture with the Russian company because of U.S. sanctions. Exxon still has not made a final investment decision, but it has invited companies to bid for construction contracts. Exxon had to exit a major Arctic oil joint venture with Rosneft in 2014 because of sanctions, but LNG projects are not part of the restrictions. Exxon and Sabic form joint venture for $10 billion petrochem complex. ExxonMobil (NYSE: XOM) and Sabic announced a joint venture this week to push forward on the $10 billion petrochemical project planned for the Texas Coast. The so-called Gulf Coast Growth Ventures project will include a 1.8 million-metric-ton-per-year ethylene cracker, two polyethylene units, and a monoethylene glycol unit, according to S&P Global Platts. The project is a key part of Exxon’s long-term plans to build out its downstream and petrochemical units. For Saudi Arabia’s Sabic, the deal allows for a larger footprint on the U.S. Gulf Coast. BP hints at dividend increase. BP’s (NYSE: BP) strong first quarter was encouraging for shareholders, but what investors really want are higher dividends. BP’s CFO said the British oil giant was considering an increase in the dividend later this year if oil prices remain at current levels. Investment banks see higher oil prices. A Wall Street Journal survey of 14 investment banks finds expectations of higher oil prices compared to last month. 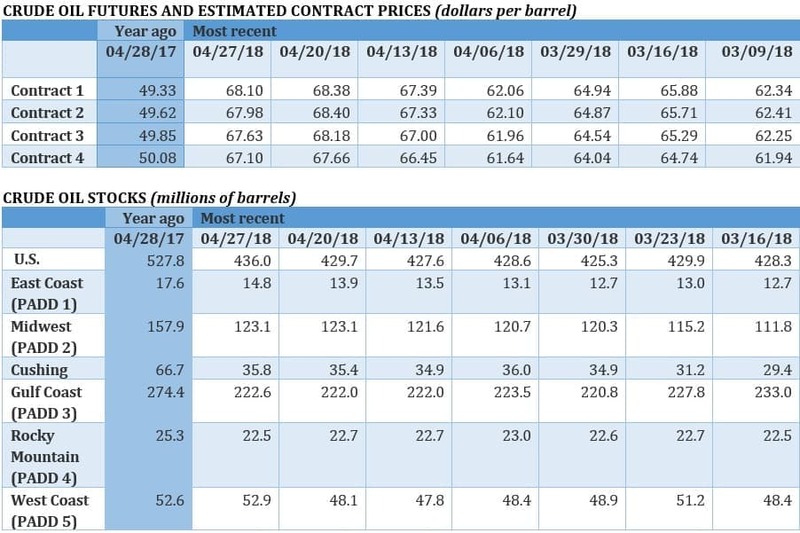 The average response on the survey points to Brent averaging $64 per barrel this year and WTI averaging $60 – both estimates are up $1 per barrel from the March survey. IMF warns Saudi budget needs $88 oil. 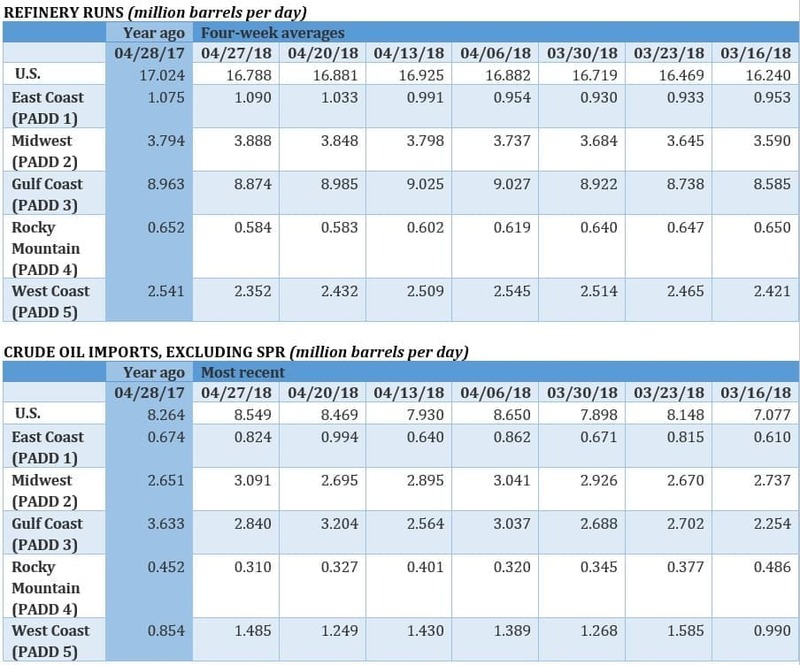 The IMF said this week that Saudi Arabia needs $88 per barrel to balance its books, compared to last year’s $82.6 per barrel. The higher price comes as spending is expected to rise. Devon Energy’s production growth good sign for Permian. Devon Energy’s (NYSE: DVN) bullish production forecast, which sees output rising 16 percent this year, bodes well for the Permian as a whole, according to SunTrust. Continental Resources sees North Dakota production surge by 53 percent. Continental Resources (NYSE: CLR) said that its North Dakota oil and gas production jumped by 53 percent to 154,000 barrels of oil equivalent per day in the first quarter, compared to a year earlier. "We are clearly seeing a structural uplift in well performance across the Bakken field," said CLR President Jack Stark. Corpus Christi port expansion could expand U.S. oil exports. Buckeye Partners (NYSE: BPL), Phillips 66 (NYSE: PSX) and Andeavor (NYSE: ANDV) formed a joint venture to build the South Texas Gateway Terminal, an export terminal in Corpus Christi that will be able to handle very large crude carriers (VLCCs). The project will add significant new crude export capacity when it begins operations next year. Venezuela could lose another 200,000 bpd by the end of the year. 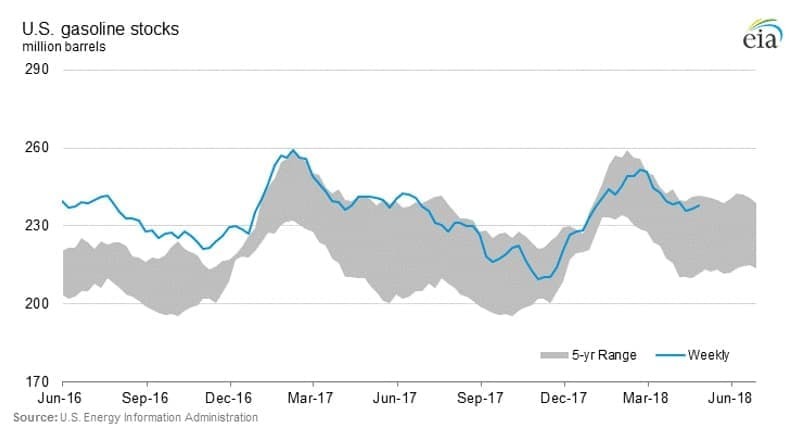 Venezuelan ministry sources told S&P Global Platts that oil production could fall by another 200,000 bpd by the end of the year, which would mean output will have halved over the course of two years. "The downside risk is large," the source said. 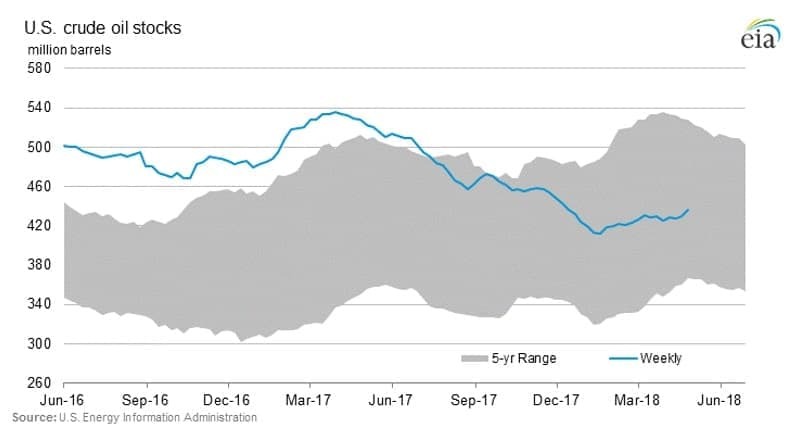 US stockpiles through the roof and up 6M barrels last week. $20 of these prices are a hedge funder scam.